Hello all, tonight between 4-5 p.m. one of my chickens disappeared. If you see her please let me know. Last seen in my backyard at 13th Ave S. and Stevens. Her name is Caramel, she’s a Gold Star. Please post here if you’ve seen a chicken on the loose! The old Fire Station No. 13 at 14th Avenue South and South Massachusetts Street, about 1915. Photo from the PEMCO Webster and Stevens Collection, MOHAI. Used by permission. The old fire station building still exists, with some changes. Photo by Wendi. 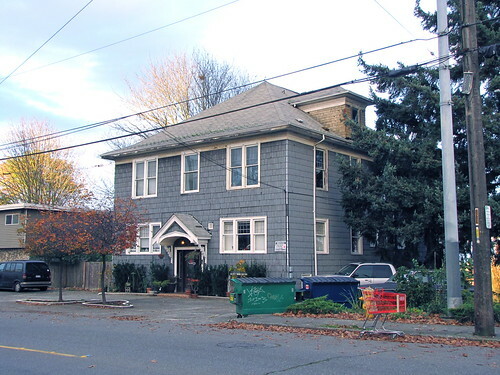 This early 20th century firehouse on 14th avenue still remains, camouflaged as a residential building. Look closely at the dormer on the roof and you can see siding that matches the siding in the 1915 picture. Other details have been changed over the years, but the building is still clearly recognizable as old Station 13. Image courtesy of Seattle Municipal Archives. Fire stations back then had to house horses, so the manure storage issues are not surprising. 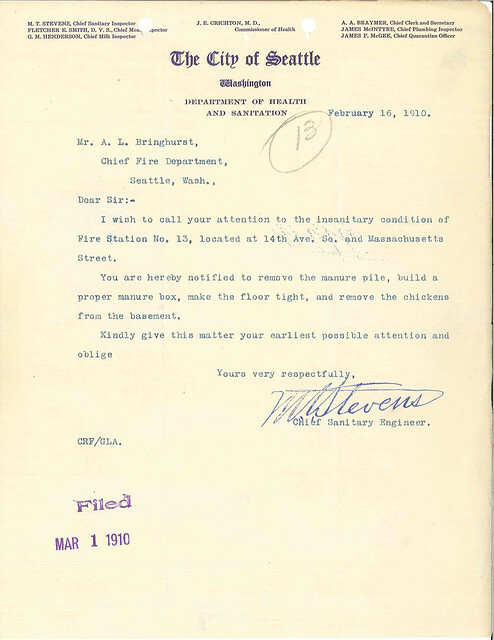 But the chickens in the basement were apparently not expected in a proper firehouse. 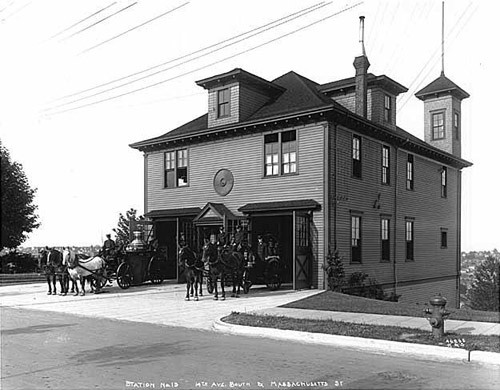 Fire Station 13 opened at 14th and Massachusetts on October 10, 1904, in what was, at that time, the center of Beacon Hill’s residential neighborhood. Over the next couple of decades, development on the Hill shifted further south, and the Fire Department changed from using horses to using motorized vehicles. These changes necessitated the building of a new station that would be more centrally located to serve Beacon Hill, and more suitable for the new vehicles. 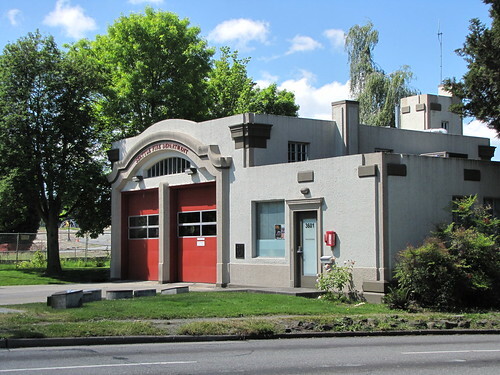 The old firehouse remained in service until the new station opened at the intersection of Beacon Avenue South and South Spokane Street in 1928. That building is a Seattle historical landmark that remains in operation as a fire station to this day. The current Station 13, opened in 1928. Photo by Jason.